Copper has been lacquered to resist tarnishing. This memorable brunch centerpiece is rich with cheesy polenta, crumbled sausage and baked eggs. Make Ahead Tip: Prepare through Step 4 up to 2 hours ahead; hold the polenta at room temperature and refrigerate the sausage until ready to bake. Tip: Shopping Tip: Polenta, a creamy Italian porridge, can be made from any type of cornmeal. Coarsely ground cornmeal, available in many natural-foods stores, is a great option because is has big corn flavor and light texture. It's usually labeled "cornmeal," but some brands are labeled "polenta." Heat 1 tablespoon oil in a large saucepan or Dutch oven over medium heat. Add onion and cook, stirring, until softened, but not browned, 2 to 3 minutes. Add 4 cups water and bring to a boil. Gradually whisk cornmeal into the boiling water. Add salt and cook over medium heat, whisking constantly until the polenta bubbles, 1 to 2 minutes. Reduce heat to low and cook, whisking frequently, until very thick, 10 to 15 minutes. (Alternatively, once the polenta comes to a boil, transfer it to the top of a double boiler, cover, and place over barely simmering water for 25 minutes. This is convenient, because you don't need to stir it as it cooks). Meanwhile, heat the remaining 2 teaspoons oil in a large skillet over medium heat and add sausage. Cook, stirring and breaking the sausage into small pieces with a spoon, until lightly browned and no longer pink, about 4 minutes. Drain if necessary and transfer to a cutting board; let cool. Finely chop when cool enough to handle. Position rack in upper third of oven; preheat to 350°F. Coat a 9-by-13-inch baking pan with cooking spray. When the polenta is done, stir in fontina (or mozzarella) and 1/4 cup Parmigiano-Reggiano. If the polenta seems too stiff, add small amounts of water to thin it to a thick but not stiff consistency. Spread the polenta in the prepared pan. Make six 2-inch-wide indentations in the polenta with the back of a tablespoon. Break eggs, one at a time, into a custard cup and slip one into each indentation. Scatter the sausage on the polenta and sprinkle the remaining 1/4 cup Parmigiano-Reggiano evenly on top of the eggs. Bake the casserole for 15 minutes. Then broil until the egg whites are set, 2 to 4 minutes. Let stand for 5 minutes before serving. 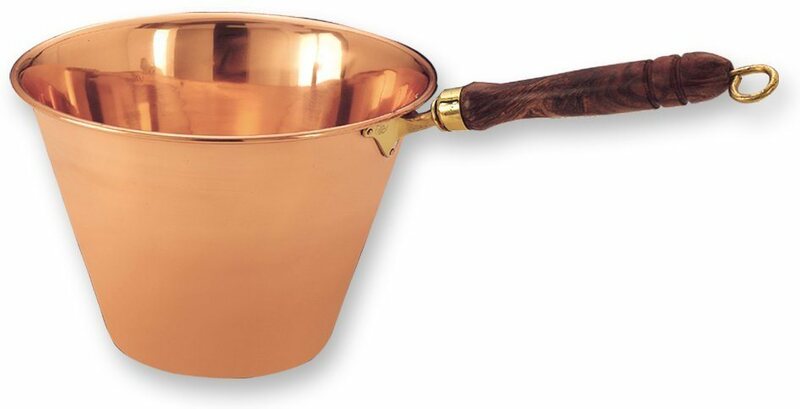 Click the button below to add the Solid Copper Polenta Pan with Wooden Handles 5 Quart to your wish list.